Feeding: Chihuahuas are omnivores. If they have a choice they will likely choose to eat natural foods like raw meat and vegetables over sweets like candy and ice cream unlike some breeds. Temperament: Chihuahuas are very intelligence, spirited dogs. They have a good sense of reasoning skills as compared to other breeds. Chihuahuas are generally happy dogs except when they are sick or separated from their favorite companion, you. Family Dog: Chihuahuas are very social with other Chihuahuas as well. Two or more males will get along very well together, provided there is not a female in heat around at the time. Females also get along very well together. They will establish a natural dominance hierarchy or pecking order but then will bond and demonstrate a great love and affection for each other. Shedding: Chihuahuas are considered average shedders. Training: Chihuahuas are considered very intelligent dogs and thus take to training very quickly. With proper, positive reinforcement, Chihuahuas will learn new commands rather quickly. Barking: Chihuahuas make great watch dogs. They are known for only barking when something is not right. If your Chihuahua is barking chances are it is something worth investigating. Weather: Chihuahuas are less affected by adverse weather conditions than other small breeds. Chihuahuas are definitely sun-worshippers and love to lie in the sun for hours on end. Even when kept indoors Chihuahuas will likely be found sound asleep in the warmth of the sunlight. Their adaptability to extreme weather conditions should come as no surprise given their history as dessert dwellers. Despite this fact they are very loyal dogs and will do whichever activities we ask them to so it is very important to take precaution and use your best judgment in these types of conditions. Appearance: Chihuahuas are described as compact, graceful, alert, swift-moving dogs with a generally saucy expression. Size: Chihuahuas should be between 6 to 9 inches tall and weigh between 2-6 pounds when they are fully grown. Companionship: Chihuahuas are very loyal companions. They may show a tendency toward aggression when in their owners arms. It can seem sweet and cute at first to see them protect you, but this behavior should be strongly discouraged. After all you don't want to raise a mean or aggressive dog. This stems from the fact that Chihuahuas regard their owners as the center of their universe. This is one of the most notable characteristics of the Chihuahua. They actually prefer human company over that of other dogs. Most dogs when called, will continue to play, but a Chihuahua will stop whatever he is doing and run to you. Chihuahuas love to be cuddled above all else. Chihuahuas will actually employ tricks to get their owner's attention when they want to be held. If you are too busy at the time to notice these clever tricks the Chihuahua will patiently wait until you have finished and take notice of them. Chihuahuas are very dedicated dogs. Head: Chihuahuas are well-known for their oversized, apple-shaped heads containing a molera, or opening in the top of the skull, much like that of a human infant. Eyes: The eyes of a Chihuahua are their most prominent facial feature. They have large luminous eyes. Their large eyes tend to tear more that breeds with smaller eyes. This is a mechanism for keeping their eyes clean and clear of debris. The eyes of a Chihuahua should be very dark except in light colored Chihuahuas where their eyes tend to be ruby colored and glow red in the dark. Ears: Chihuahuas are also well-known for their large, flaring ears, a characteristic that makes them easy to recognize. Muzzle: Chihuahuas have what is termed a scissor bite. This is where the top front teeth barely overlap the bottom front teeth and the bottom canine teeth fit neatly into the slight indentation just in front of the top canines. A distinguishing characteristic of the Chihuahua is that they may have one or more missing teeth and have a tendency to lose their premolars at a very young age. Their week dentition and small proportioned mouth may be attributable to their history of living on vegetation and other small prey. Neck: Chihuahuas should have a medium length slightly arched neck. Body: Chihuahuas should have a marked forechest without any sigh of a protruding sternum which may be a sign of serious abnormalities. The front legs of a Chihuahua should be completely under the body so the shoulders block any view of their chest from the side. It is very important for a Chihuahua to have good shoulders in order to run, jump and change directions instantly when playing or chasing prey. The ribs of the Chihuahua should be well sprung to accommodate their well-developed heart and lungs. The rib cage needs to be long enough to protect all of their internal organs. Just behind the 7th or 8th rib their underline should raise slightly toward the back legs. Their body should be slightly longer than it is tall with a strong level back. Hindquarters: Chihuahuas should have strong, muscular hindquarters with well-defined tendons. If these tendons are too thin or the groove in the back legs where the tendon is supposed to fit is too shallow then the tendon may slip out of place and cause lameness. You should strongly discourage your Chihuahua from jumping up and down on there hind legs as this could cause injury to their knees, especially while they are young. Walking and jumping on their back legs is a very common trait in Chihuahuas. This is their attempt to get closer to their devoted companion because Chihuahuas love to give. Feet: The feet of a Chihuahua should be small and dainty with slightly spread toes, instead of the long thin toes seen in their history. This trait had been bred into the Chihuahua over the years because it was thought that the 'cat-like' foot found in other breeds looked more appealing. Tail: The tail of a Chihuahua is just a continuation of their spine and thus should be carried high and curled over their back. It should never be lower than the topline of their back. The posture of a Chihuahua's tail gives a strong indication of the structure and health of their spine. Color: The Chihuahua is accepted in any color or color combination. Black with tan markings is the most common color combination. Coat: There are two distinct coats for the Chihuahua. Chihuahuas can be classified as either a short coat or long coat Chihuahua. Short-coated Chihuahuas have a short, smooth coat. While long coat Chihuahuas have a coat consisting of long, possibly wavy fur. Life Expectancy: Chihuahuas have an average life expectancy of around 15 years. Characteristics: Chihuahuas are known to be extremely loyal and devoted dogs. They usually will favor one owner above all others and make that person their sole mate. They love human companionship and will generally seek it out. Chihuahuas are known to have a high feeling of self-importance. They can usually be seen strutting purposefully around the house. Chihuahuas have a tendency to shiver from fear or excitement. If they show signs of unwarranted fear it is best to reassure them that they are okay without praise as to not enforce their unneeded fear. If they are actually presented with a real form of danger then they should be picked up or otherwise removed from harms way while maintaining a casual tone so that their fear is not strengthened. While they may show signs of unwarranted fear there are other times when they should be fearful but are not. It is not unlikely for a Chihuahua to take a dive off a high piece of furniture without a moments thought to the consequences. They are also known to not be intimidated by larger dogs when maybe they should be. It is important to make sure to never place your little Chihuahua on a high piece of furniture and leave them unattended when they are young. Once they have they ability to jump safely on and off the furniture by themselves then they should be fine. Also they should be closely supervised when around other unknown dogs especially larger ones. Chihuahuas love to sleep under blankets or pillows. It is not uncommon to see them burry themselves underneath a blanket all on their own. Chihuahuas make great pets for all types of people. They want nothing more that to be with you and to please you above all else. They are very perceptive of peoples' moods. If you are sitting down relaxing they love to lay quietly in your lap with you. If you are up and moving around they will watch every move you make most likely being right behind you every step of the way. Health: The Chihuahua is a very hardy dog as compared to other breeds. They are prone to some of the other aliments that plague other small breeds including cleft palates, hypoglycemia, hemophilia A, secondary glaucoma, heart-valve problems, lung conditions and hydrocephalous. Before purchasing your Chihuahua you should discuss these and other health risks with your breeder to see if there may be an increased risk of these in your Chihuahua. History: The history of the Chihuahua is has been debated for years. There are many different beliefs as to their origin. One such belief is that the Chihuahua is a descendent of the fennec fox, Fennecus Zerda, which was a small desert dwelling animal from Africa. There are some very striking similarities between the two animals. The fennec, unlike other foxes, chooses to live in groups. 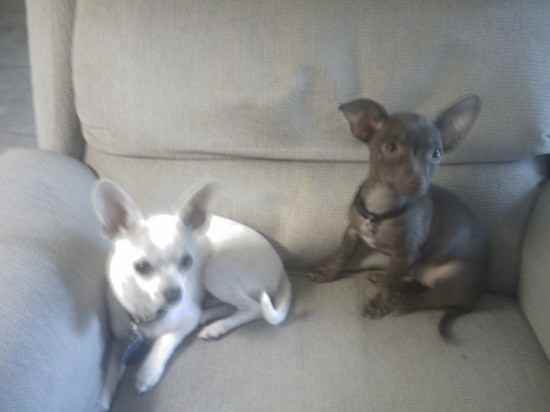 It is also commonly know that Chihuahuas prefer to have other Chihuahuas as company. Both the fennec fox and the Chihuahua also prefer to chase and eat small insects, rodents, and lizards. The fennec fox was also known to have very poor dental health which is unfortunately another common trait of the Chihuahua. Another popular theory as to the origin of the Chihuahua is that they are the ancestors of the hairless dogs of Asia. It is believed that these dogs migrated from Russia through the Bering Straits and into what is today known as Alaska. Yet, another possible theory is that the Chinese brought their own version of the Chinese Crested to the Americas as early as the 7th century BC and that this is the true ancestor of the present day Chihuahua. Still others believe that the American Chihuahua is linked to the hairless dogs who originated in Mexico, known as the Xoloitzcuintli. There are others who totally disregard the connection between the Chihuahua and all types of hairless dogs, because of the amount of physical differences between the two. All hairless dogs are known to have rectangular heads and long round tails. Both of these characteristics are most unlike those of the Chihuahua. Others believe the Chihuahua has ancient roots in Egypt or Sudan and then migrated across the Bearing Straits or were brought through the Mediterranean countries into Malta. There is some striking physical evidence to support the linkage between the Chihuahua and the Maltese. The most commonly accepted theory is that the Chihuahua migrated from Mexico and that the Chinese took them back to China with them instead of the other way around. It is believed that the latest ancestor of the Chihuahua is the Toltec Techichi. The Techichi was a very small dog, or as some believed a rodent, who lived with the Toltecs of present day Mexico City. The Toltec dog is represented by stone carvings found in their ancient city ruins. These civilizations gave way to the Aztecs which have also shown signs that these dogs were held in highest regard both as companions and religious articles. The first known record of the Chihuahua as a specific breed was around 1884 when Mexican peddlers were known to be selling them to tourists. The breed was first recognized in the US in 1903 and the first Chihuahua was officially registered shortly after in 1904. In 1915 there were only 30 Chihuahuas registered. By the 1970s there were well over 25,000 of these dogs registered in the US alone. It took until 1952 for the split to occur between the long-coat and short-coated varieties. Today there are over 20,000 Chihuahuas registered by the AKC per year.